Saturday afternoon, I took two Cowpokes and Grandma T to the Larry's Old Time Trade Days. 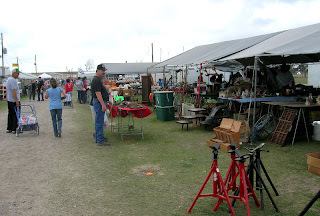 Only once a month, they have this huge flea market. I had never been to it. I had a bunch of projects that I want to do and I had a few things in mind that I really wanted to get. 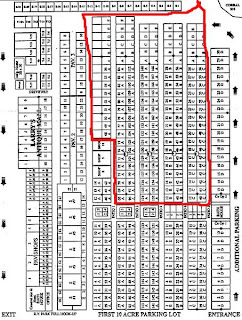 Here is a map of the place. We covered the area where the red line is. I didn't even know there was all that other stuff. I don't know how I missed it. But Grandma T was ready to sit down. She couldn't believe that I had Cowpokette in her sling and Little Cowpoke in the stroller and all our bags on the stroller, plus my purse and diaper bag, and I still wanted to keep going!! I told her I am used to having one more kids to watch, so this was nothing!! There were rows and rows of tents. So much stuff to look through. I was so excited. And I know I missed a lot. I want to go back next month and start at the other end. And hopefully I can leave my kids with their Dad. 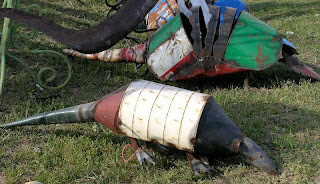 Piles of old metal stuff! 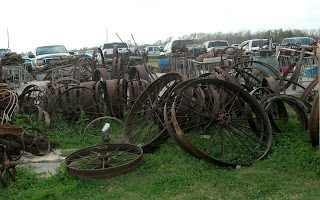 Lots of wheels and old tractor seats!! I didn't know what to get first. Tables full of more stuff. This vendor was one of my favorites. 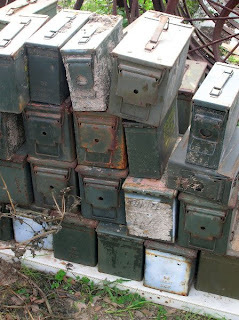 You could get some old ammo boxes. I know the boys would love those, to put their Army men in. I should have gotten one. Next time. 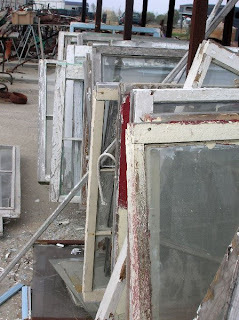 I found an old window for another project I want to do!! My sister showed me an idea of how to paint a sign on the window. I found the perfect window and I am going to do it!! 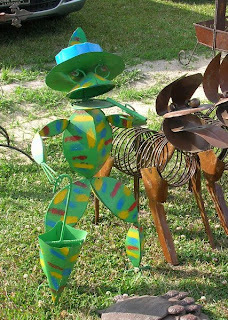 Then there was this fantastic metal sculpture place. These were so much fun. There was this fun Mexican guy selling them. He was yelling, "I am selling them to you for the same price I get them for in Mexico!!" Then he told me that the fun little tractor was 150 dollars. Cute yes? But I was not about to pay 150 bucks for it. And then I asked him if that was 150 pesos? He just looked at me like I was stupid. Well.....I had to ask. He did say it was for the same price in Mexico. But he did have a bunch of cool stuff. I think I need some of those in my yard. Aren't they fun?? But they were expensive. He had other metal wall hanging things and such. But I didn't even walk over and look at them. I would have loved to, but I didn't see them until we were driving out! I am telling you, I missed a lot of stuff. Here is all of Grandma T's and my loot. Grandma T got the turtle pin cousin and the knife holder with three knives. I got the rest. I love the huge ceramic jug. I am going to put all my wooden spoons in it. 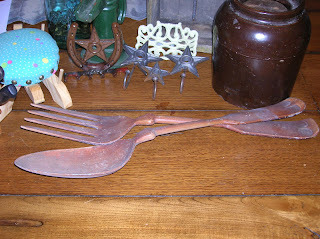 And the metal fork and spoon are going to hang on my wall. Then I found that box, for one dollar!! I was so excited. I am going to use it as a shelf in my room. And you know you can't go to a flea market with kids, with out buying some super cheap, noise making toys. They loved them. Those loud airplanes. But it made them happy. These things made me happy. Those star hooks, I am going to put them up in the boys' bathroom for towel hooks. They were a buch each. And behind those is my soap dish. 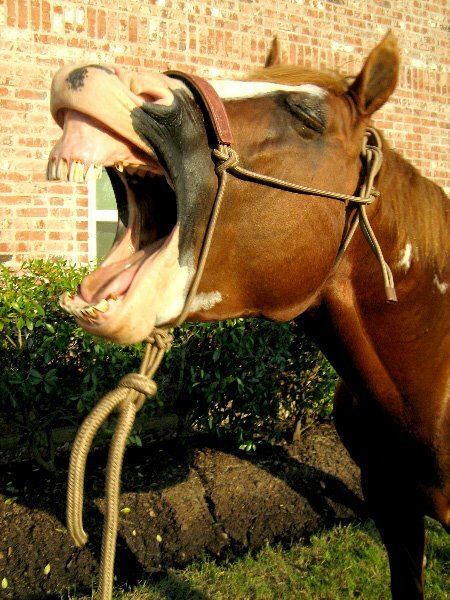 The horse shoe next to that has an old rake hooked to it. I am going to hang that in the boys' bathroom for them to put their wash cloths on. If you roll the wash cloths they fit right into the rake. 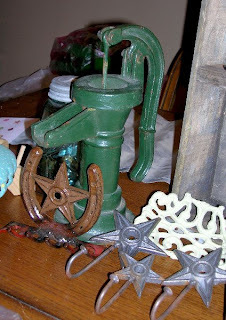 And there is that super cool water pump. I asked Mr. 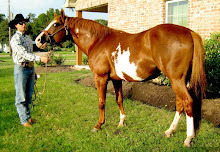 Cowboy if he would make me a small water fountain into a huge wooden barrel. He just looked at me like I was crazy. But I said please, and he smiled and agreed. I found three bottles. One for each of my kids. I am going to clean them up and then put their pictures in them. So they will become picture "frames" for my pictures. 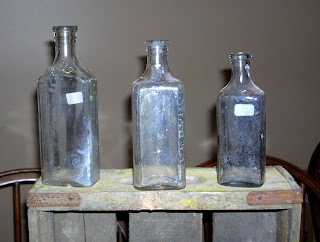 Those bottles were fifty cents. I found these fun clips. I got them for fifty cents. I am going to use them for my chicken wire or for another project I want to do in the kids' hallway. A way to display their art work. 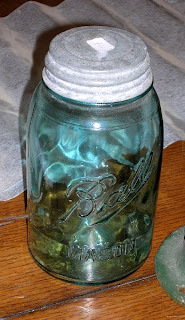 I should have bought more, sigh....... And I found another super cheap mason jar! I can't wait to get all my projects going. But first Mr. Cowboy needs to build me my huge picture frame for on the wall. We had a lot of fun. I could have stayed a bit longer, but both kids were sleeping and Grandma T was about ready to fall over. I can't wait to go back. I want to go next month too!!! Great buys! and totally awesome ideas you have!! I love flea markets too. Yours looks wonderful and you got some great treasures. You are SO bringing me there if I ever get down there!!! 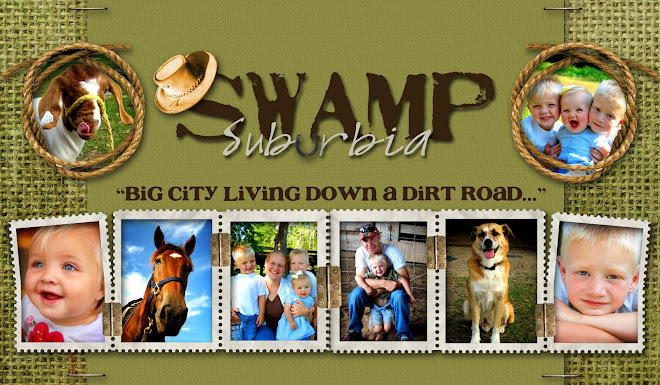 I swear I'm heading to swampland and shopping at the market with you! 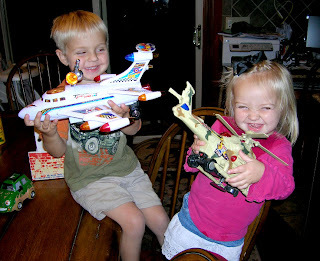 :) It looks like SO much fun...and such good finds and prices. I love everything you got. You will have to show us all of your finished projects, too! Hey- nobody else has said they couldn't see the posts...I think it's just you! I wonder whats going on? I want to go next time! I want to go next time!!! 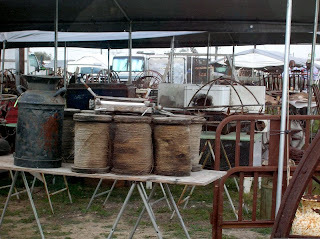 What a great flea market, we just don't have ones that big here and none at all in the wintertime. A few on the coast in the summer months, but nothing like that one! Yikes! I would have gone crazy! Great finds!! 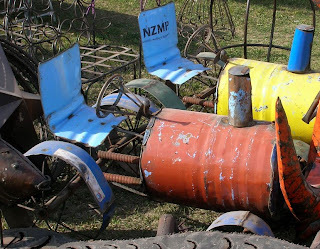 I never find great stuff like that at flea markets around here. Looks like I need to journey to swampland too. That's a lot of ground to cover, especially with little ones and a grandma in tow. Looks like a fun day though. So many great finds! I can't wait to see your finished painted window! (no pressure, lol.) Be sure to email me if you're happy with it, I'd love to share it. Oh, I would have such fun there! Whoa! 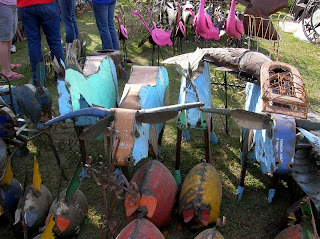 You've got some awesome flea markets. We don't have cool stuff like that. 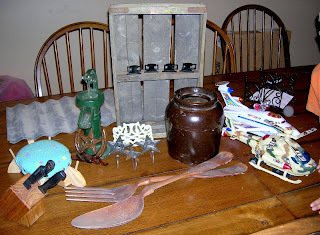 Mostly garage sale junk and crafts. 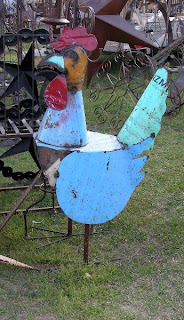 I want that cool metal rooster! Love it! Those ammo boxes are awesome. We've seen them when we found geocache boxes. I've often wondered where folks bought them. hah! Soooooooo not fair. I totally need to visit when you go. I am soooooooooooooo jealous!! So much fun! I love trade days... I never make it to Canton up by Dallas. And Warrenton is only twice a year, when I have to work. UGH. But Winnie has a small one just outside of Beaumont once a month. Oh, wait... that's the one you went to! Next time, email me and I will meet you there!